YJ’s husband is a car expert. They own a very nice yellow convertible. 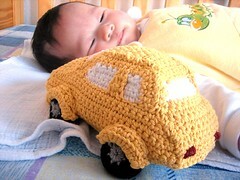 Since she was expecting a boy, I wanted to make him a car, which has to be soft and safe for newborns. 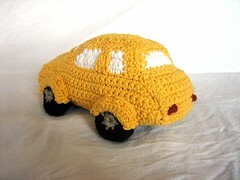 Crocheting (amigurumi) would be the easiest choice to achieve these goals. 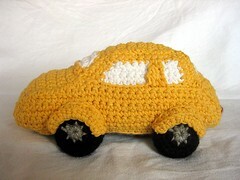 I happen to have bright yellow cotton yarn at hand. Convertibles are too complex and not so easy to be infant safe. Hence, I just make a rather ordinary car with a little race car like touch in the front. The frustrating part is, as always, the assembling part. The flaws due to careless designs became so obvious during this step that I have to ravel some pieces until it appeared to be alright according to the non-crafter in the house. Mr. Y was a little surprised and a little unsatisfied when he realized the car was not for his daughter. At the meantime, he quickly rejected my proposal of making a red Beatles in a similar manner. “No, no, no crocheting….you need to sew with some lasting fabrics……”, he said. That’s why it is so hard to start a project for little K! 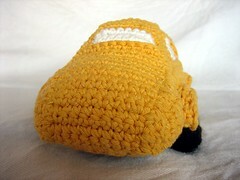 When I was working on the car, there are a few crocheted cars over the internet very inspiring. Here, here and here. 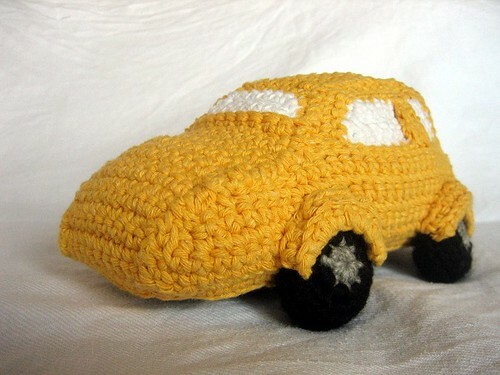 I also found out that those cute “anne-claire petit” cars and other crocheted items of the same brand are not hand-crafted by the designer. Instead, they are outsourced to China. It is not much different from the plushies “Made in China”. My friend Mars used to send me pictures of some anne-claire petit toys from his trip to the Netherlands. The toys were apparently displayed as indie crafts. Many people that have seen these toys, including me of course, are easily convinced that they are hand-crafted by the designer. Now, I felt misled. I would certainly appreciate the Nici animals more than ever now. I bought a Nici’s Federic Fox yesterday. It’s surprising that little K showed high interests in the fox. (She hasn’t been attracted by any toys so far.) Therefore, he now has a new Chinese name and belongs to our princess. Sorry, I didn’t write down the pattern. You may check out the book “あみぐるみcollection（vol．8）“. There are a few car patterns in this book.